His Majesty the King’s Scholarships: This scholarship is offered to candidates willing to pursue courses in School of Engineering and Technology (SET) and School of Management (SOM) at Asian Institute of Technology. Her Majesty the Queen’s Scholarships: Candidates willing to go for environmental-related courses offered at the School of Environment, Resources and Development (SERD), AIT will get this scholarship. Eligibility: To be eligible for the scholarship, the candidate needs to have an excellent academic record in studies and should possess 4-year graduate degree with minimum 3.5 CGPA. Benefits: The Tuition & Registration Fee of the candidate will be covered under the scholarship along with accommodation & Living expenses. Nomination: The eligible candidates can be nominated by Department Head or Faculty Advisor of the institution using the nomination form available on the website. Nationality: Applicant from any Asian country can apply for the Scholarship. Academic Qualification: The candidate needs to have a good education background with a 4-year relevant undergraduate degree with minimum 3.5 CGPA. Language requirement: The applicant should be fluent in English and should have achieved a valid TOEFL score. Language Test: The applicant can alternatively take AIT English Test administered by the AIT Language Center. Duration: The scholarship will be offered for a period of 22 months. Tuition Fee: Scholarship covers the registration fee (80,000 Thai Baht) and Tuition fee (768,000 Thai Baht) to pursue Master. Accommodation & Living Expenses: Candidates will be provided with accommodation & Accommodation and bursary for living expenses of total 253,000 - 330,000 Thai Baht depends on the lifestyle of the candidate. Details required: In the nomination form, the nominator should fill the details related to himself and the nominee, his academics and intended field. The eligible candidates will be nominated by Department Head or Faculty Advisor of the institution using the nomination form available on the website. 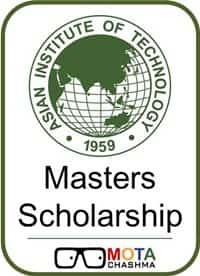 The candidates are also required to make application for the admission into Asian Institute of Technology in their desired masters program.